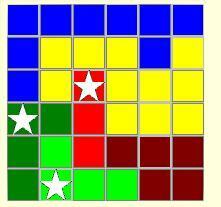 Given a square N x N grid divided into N sections, place a star in each section with no two stars in the same column or row, and no two stars diagonally adjacent to each other. The program allows grid sizes from 2x2 through 10x10, although no solutions exist for sizes less than 5x5. The "Edit" feature to change variable value names lost rules and facts from the save cases file if they had not been viewed before the changes were made. Rules generated by "Order" rules were not displayed in the Generated Rules display form. Some text of the Reasons for assigned values to truth truth table entries had column and row references reversed. The big one that took a week to find: The program implements a syllogism called "Disjunction Elimination" which says that if A implies B, and B implies C, and we know that A and C cannot both be true then we can conclude that A is not True. When applied to "If" statements generated by "Order" and "If" rules generated a bad fact if the "If" was assign a False value (i.e. "If A then Not B" instead of "If A then B"). Our "Brain Games" daily calendar puzzles are usually pretty good, but the author of this one thinks that "Cyclist" is the only answer. Writing a program seemed more fun than simply turning the calendar page over find the solution. A 50 line beginner's level program performing a search of our 62,000 word dictionary finds the solution quickly - all 211 of them! Boy, did the Brain Game guy get this one wrong! Check out Word Search, the latest addition at the bottom of the Beginner's page. Expressions From Integers Version 2 adds an extended version of the original puzzle. This one has multiple completed input figures and a single target figure with one value missing. The strategy for this one is to find an single expression template which will evaluate to the number position containing the "?". The same value positions and operations applied in the same order for each figure must equal the value in the "?" position for that figure. The successful template when applied to the incomplete figure will provide the required value. 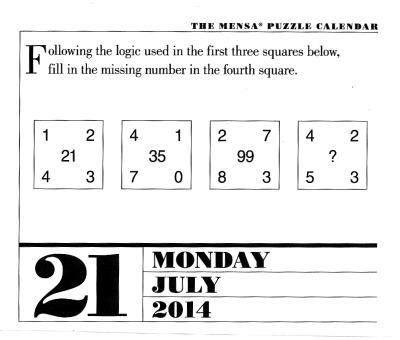 Another puzzle programming exercise from my favorite source: the Mensa Puzzle-A-Day Calendar.